Rangi please can you add the feature for see the trainer pics and the new 2 trainer classes in a clean Crystal rom? I've not done this for GSC, but I have done similar pokered; Mateo said he copied the routine to display the Pokemon pics yes? So essentially do the same; copy the routine for Pokemon pics, tweak the variables to look for the trainers and not Pokemon, and call that revised routine when you want to display the trainer pics. Hope it's ok with Rangi if I post this. No problem. :) And yeah, Halfshadow, if you apply those changes to regular pret pokecrystal, the ROM will be just like a clean Crystal ROM except with the fossils added. Someone could tell me how I could use these links please? :D I don't know these files, I know could appear boring, but I need help to know how assembly the repositary files to a ROM. I have to replace some files with the updated trainer classes from these two repositary, right? Seems to be 18 files, there is also the new script command, when the command is added how hex byte call the trainer pic via script? Or I can simply use a PKSVUI script string to compile the museum script? They have instructions. Please read INSTALL.MD and get back to us if you have problems. However are you sure that the fossils classes are the only changes by a clean Crystal? I found something else in the repository, like HG/SS musics as example. But I made other changes myself to my Crystal, there is a way to obtain only the trainer classes with fossils sprite and new script command to see their pic? P.S. there is a way to paste the string for the command line? Isn't impossible for me and I have to rewrite all myself. Nope, the right mouse button is disabled, I open the program using the default bat. Or I have to use the Windows CMD? But which exe I have to open with the CMD? 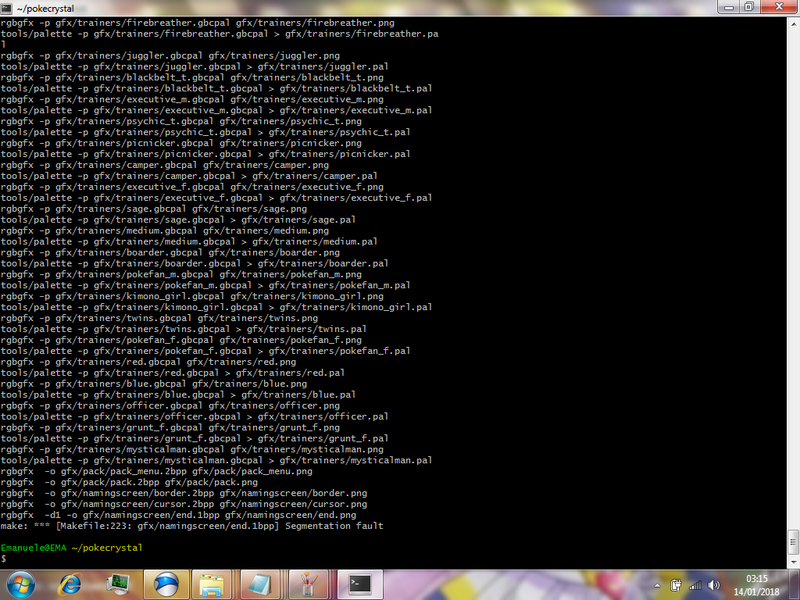 And in the program drive I have to put the hacked repository downloaded form Github? If yes in which subdrive? Run via mintty.exe in Cygwin bin folder. Cygwin install should have given you a shortcut to that in your start menu. Start menu shortcut sets terminal to home folder automatically, if you run mintty.exe manually then you'll have to cd ~ first. If you want to run it via the .bat, which runs everything in windows cmd (not entirely sure how functional that is compared to Cygwin terminal), you can right-click the window's title bar, hit Properties, and check QuickEdit mode. Then right-clicking will automatically paste clipboard contents. Ok, I have to have the hacked repository in a subdrive or download automatically from github? OMG I don't know how I have to do now. I don't have a good feeling with the command line 'cause is very touchy 'cause you have to type correctly all the addresses and commands, and however I don't know if the error is on the folders or something else. The original Crystal disassemly from Github have to be present? Have to be in the pokecrystal folder that have to be in the minty.exe folder? And I have to replace the hacked files in the pokecrystal drive to assembly the hacked rom? If I'm wrong what folders and files are necessary and where have to be? Is very confusional for me. You should really read INSTALL.md like Mateo told you to. You didn't install the required packages. When you get to "Select Packages" in the installer, change View to "Full" and you can enter the package name in the search bar. Find the packages of the exact same name (nothing more, nothing less), you install them by clicking "Skip" which will change it to a version number (indicating that this is the version of the package that will be installed, it selects the latest version automatically.) Hit Next to finalize the install. You were working in /usr/bin/ here, which I guess isn't the end of the world, but I guess it could get messy so it's easier to just keep it to home folder. And is a lot of stuff, I can't find make, git and gcc-core, also I installed all the stuff related to the "make` `git` `python" like said in the install.md of the hacked repository using the search box and it installed about 5 GB of stuff that don't work. Is normal that install many stuff? You didn't install the required packages. 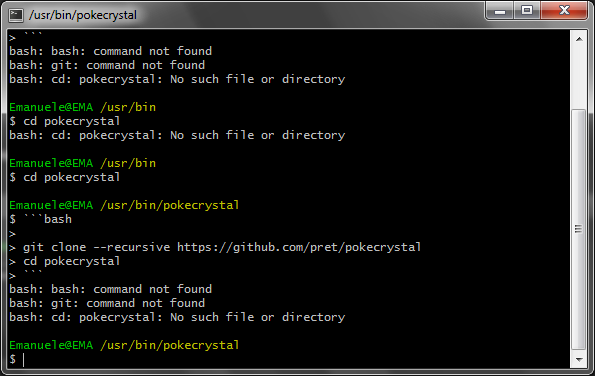 I had a folder "pokecrystal" with the original Crystal github repository in the bin folder, however I don't know what the terminal did. I can't find any complete rom however. However to obtain a rom with the hacked repository, I have to replace the files? What mean with "segmentation fault"? and how I can solve? I downloaded the latest version. And I tried first with clean Crystal repository. Why have to be so complicated? Can you please make the patches for me, adding only the pictrainer asm, the 2 trainer classes with the Kabutops/Aerodactyl fossils in a clean Crystal and Gold please? I'll add you in the credits. I downloaded a 5GB tool that don't work correctly... I tried it but wouldn't work. Otherwise there isn't a way to do it via HEX editing? Will be easier and safe. 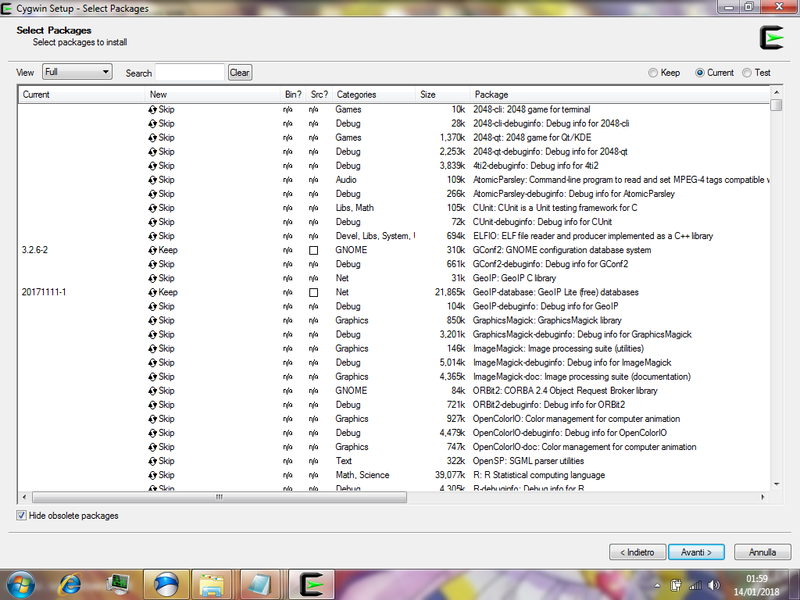 It doesn't really matter if you installed extra unneeded stuff, it simply won't be used by Cygwin when you compile. 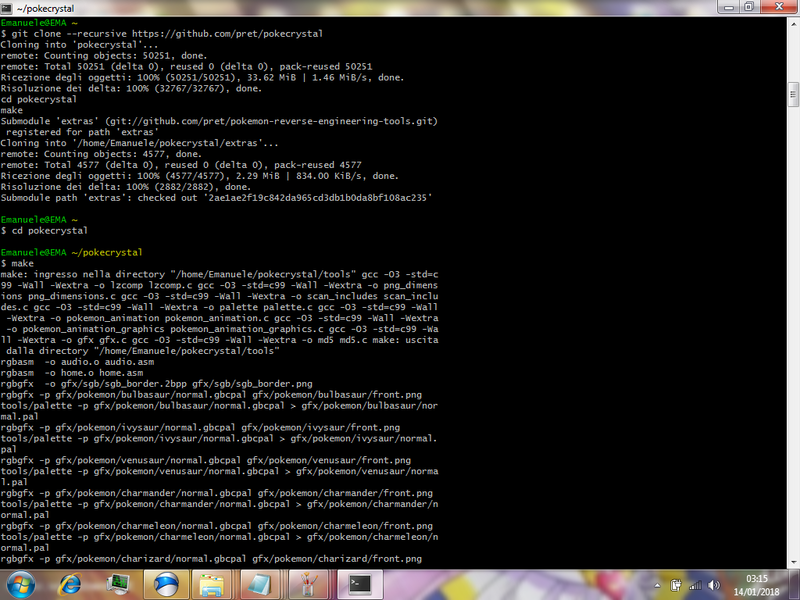 Really all you need is default Cygwin installation, with make, git and gcc-core packages installed. Was that error from trying to compile vanilla pokecrystal, or was that after you made the aforementioned changes to add the fossils? Definitely not easier in any way and neither safer for the hack's reliability. The only advantage of hex editing is that it teaches you some things about memory and pointers that are more abstracted in the disassembly, so that when you learn why the dissasembly is so much better, and likely restart your unmaintainable hack on it (many people been there if they don't give up earlier), you can take advantage of those little concepts that you learned. 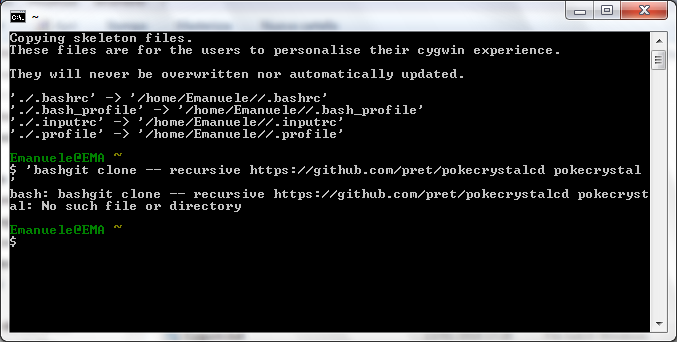 Meanwhile, make sure to install the 64 bits version of Cygwin if your operating system is 64 bits. This may very well be the reason for the segfault. My OS is Windows 7 32 bits. However IMHO is safe 'cause I'm sure of the changed bytes, I don't know if the re-assembled roms are different by the original about the offsets. I started my hack on a retail version and if the offsets are changed obviously the patch will not work.